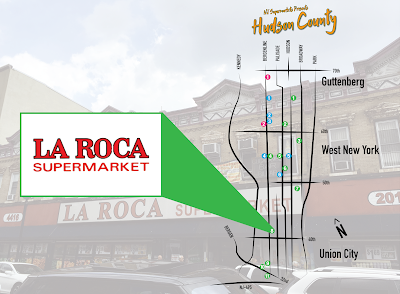 La Roca Supermarket is a Union City institution, having been in business for more than 30 years. It was the original Latin supermarket in this area. It's also located directly up (and across) the street from A&D. Like Extra, La Roca's main entrance is in the front, but there is a rear entrance as well. Unlike Extra, La Roca does not have a private lot. The rear door goes to a municipal metered lot. You enter along the front wall, with produce in the front left corner, with the expansive butcher counter along the back wall. Like so many businesses that started small and expanded into neighboring buildings or storefronts, the layout is a little bit of a maze! The produce department is kind of in a separate room. The building is awesome! La Roca could have done something better with their sign, but the trim and details are great. In this area, Bergenline is a one-way going south. Let's see if I can get this straight. My back is to the front wall (Bergenline). We're looking towards the back wall. Produce is in the corner to my left and the entrance is on the other side of this shelf thing to the right. Dairy is in the first aisle to the left. There! Immediately inside the entrance, there's a small shelf with a few major produce items (probably sales or loss leaders -- apples, avocados, potatoes). When I first walked in, the produce department here was not visible, so I thought that was their whole produce section! This is the left side of the store, facing the back wall. Not a bad produce department at all for such a small store. Very fresh. In the first aisle, there is a gumball machine. Of course. Because that's what every supermarket has in aisle one. I'd never seen these dairy cases before. Two-level, with the entire unit on the sales floor. The doors slide (top and bottom independently of each other). 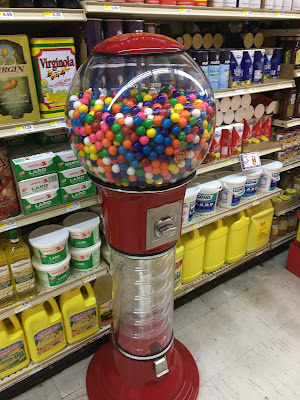 This is one of those quirky things you're only going to find in this type of store! From the back milk corner, here we're looking along the back wall of the store. The massive butcher counter lines the wall to the left here, just behind the bags of flour (?). Obviously, this is the main attraction in the supermarket! I believe there is also a small deli. The rear entrance is just to the right of the butcher. A look down one of the aisles. Not an inch of space is wasted in this store. And obviously it's a heavily-used resource! Maybe we can get a native Spanish speaker to fill us in on what that (hand-lettered) sign in the top right corner of this picture says. The way I understand it, it says that the store is not responsible for packages (meat) left at the butcher counter -- which makes me think that you might have to pay for meat at the butcher. A look at the back of one of the two registers at the rear entrance just next to the butcher. I don't know how you could use a cart in this store. Like so many of them that we've seen, it's hard to navigate just as a person, let alone with a cart! Yes, that's the only packaged meat in the store (aside, of course, from cold cuts). If you want prepackaged meat, you're probably going to go to ShopRite in North Bergen, not La Roca, which specializes in its carniceria (butcher shop). One register, which doubles as customer service desk, in the front corner. Check out the pattern on that floor! Obviously it's been patched many times! Kudos to La Roca for doing what they do really well, and for a long time. This is definitely a landmark in the area. But if you go, be prepared to wait for the butcher service!